'Welcome to my tabletop & roleplaying gaming site. This the place where I'll be posting up ideas, photos, campaigns and general rambling about mostly tabletop wargames and roleplaying games. also a feature known as the "Tales from the Fallen Hammer"
Overview: This is a mission that could be run as a single session or the start of a campaign. Location: Minophix sector within the ultima segmentum, upon the ice world of Silvoon III, its major city Gardia city. 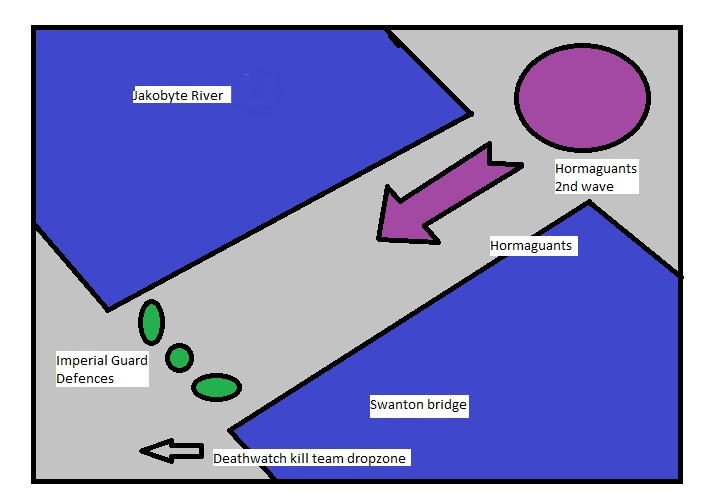 Mission briefing: Captain Horsten is in command of the defence of Swanton bridge, the last of only three that cross the Jakobyte river that runs through the city.The defences of imperial guard, the Gardia 48th are holding against swarm after swarm of guants. The bridge must hold to mount a proper counter attack and re-take the city by the space marines of the Raptor chapter. however time is running out, the re-enforcements haven't arrived and larger creatures have been spotted upon the over side of the bridge. The Deathwatch commander has dispatched your squad to secure the bridge, it cannot be overrun or destroyed.
" I ran this mission for the first time just last week. i gave the kill team of six marine kill team thirty requisition points each (180 for the total team). which may have been too much. They managed to buy enough special ammunition for the mission (I did give them ammo for the mission instead of the one clip it was supposed to be) and the devastator in the kill-team also managed to get a Missile launcher with Frag and krak missiles. I should also note that i hadn't used the updated errata so bolters were able to go full auto to devastating effect. so if anybody has used this mission with the errata in mind,any feedback on how the mission worked would be appreciated"
Dreadball - Arcanacup Major league III Ultimate final. Painting: Empire of the blazing sun starter fleet for Dystopian wars and Dreadball Crowd. Writing: A roleplaying campaign for the legend of the five rings. Many images on this blog are sourced from the internet and used without permission of the owner, no challenge is intended to their status intended, all Rights Reserved to their respective owners. Any images will be removed if requested by the respective owners. 40k, Adeptus Astartes, Battlefleet Gothic, Black Flame, Black Library, the Black Library logo, BL Publishing, Blood Angels, Bloodquest, Blood Bowl, the Blood Bowl logo, The Blood Bowl Spike Device, Cadian, Catachan, Chaos, the Chaos device, the Chaos logo, Citadel, Citadel Device, Cityfight, City of the Damned, Codex, Daemonhunters, Dark Angels, Darkblade, Dark Eldar, Dark Future, Dawn of War, the Double-Headed/Imperial Eagle device, 'Eavy Metal, Eldar, Eldar symbol devices, Epic, Eye of Terror, Fanatic, the Fanatic logo, the Fanatic II logo, Fire Warrior, the Fire Warrior logo, Forge World, Games Workshop, Games Workshop logo, Genestealer, Golden Demon, Gorkamorka, Great Unclean One, GW, GWI, the GWI logo, the Hammer of Sigmar logo, Horned Rat logo, Inferno, Inquisitor, the Inquisitor logo, the Inquisitor device, Inquisitor:Conspiracies, Keeper of Secrets, Khemri, Khorne, the Khorne logo, Kroot, Lord of Change, Marauder, Mordheim, the Mordheim logo, Necromunda, Necromunda stencil logo, Necromunda Plate logo, Necron, Nurgle, the Nurgle logo, Ork, Ork skull devices, Sisters of Battle, Skaven, the Skaven symbol devices, Slaanesh, the Slaanesh logo, Space Hulk, Space Marine, Space Marine chapters, Space Marine chapter logos, Talisman, Tau, the Tau caste designations, Tomb Kings, Trio of Warriors, Twin Tailed Comet Logo, Tyranid, Tyrannid, Tzeentch, the Tzeentch logo, Ultramarines, Warhammer, Warhammer Historical, Warhammer Online, Warhammer 40k Device, Warhammer World logo, Warmaster, White Dwarf, the White Dwarf logo, and all associated marks, names, races, race insignia, characters, vehicles, locations, units, illustrations and images from the Blood Bowl game, the Warhammer world, the Talisaman world, and the Warhammer 40,000 universe are either ®, TM and/or © Copyright Games Workshop Ltd 2000-Present, variably registered in the UK and other countries around the world. Used without permission. No challenge to their status intended. All Rights Reserved to their respective owners. 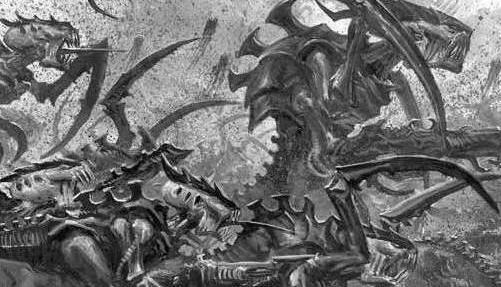 website is unofficial and is not endorsed by Privateer Press.